Crude oil by rail continues to be a growing trend nationwide. The amount of oil and other "refined petroleum products" carried by trains climbed nine percent in the first seven months of this year, compared to the first seven months last year. The U.S. Energy Information Administration lays it all out in an article published this morning, which includes this chart. Here in California, the increase in crude-by-rail shipments puts the national numbers -- proportionally speaking -- to shame. Sixty-six percent more oil came into California by rail in the first half of this year, compared to the first half of last year, according to numbers from the California Energy Commission. Data from the California Energy Commission. Fiery derailments and explosions in other parts of the country have drawn attention to safety problems with the rail cars used to transport oil. Last summer in Quebec, a train carrying crude from North Dakota's Bakken formation exploded in the town of Lac-Mégantic and killed 47 people. The federal government is proposing safety improvements. The increase in carrying crude oil by train is happening because there's an oil boom in North America. To get all that oil from Alberta, North Dakota and other places to refineries here in California, oil companies must use trains. There are no pipelines coming into California from other states. Most of California's oil is either drilled here in the state, or arrives by ship from Alaska or overseas. 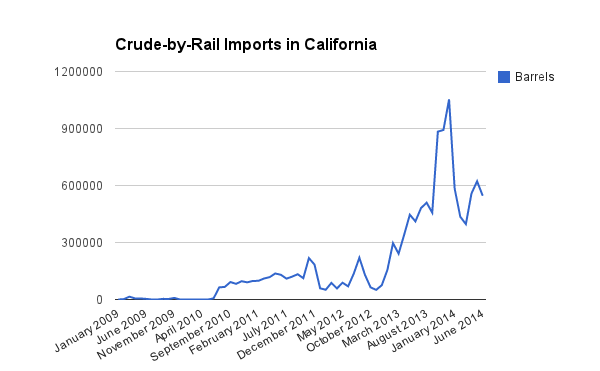 Oil traveling by rail into California still accounts for a small percentage of all the crude California processes. If oil-by-rail terminals that are proposed in Benicia, Pittsburg, Santa Maria and Bakersfield go through, then that proportion could rise from one percent to more than 20 percent. Of the two Bay Area projects, the one in Benicia is currently under review, and the one in Pittsburg is on hold. Also in the Bay Area, Burlington Northern Santa Fe Railways is currently delivering oil to a rail yard in Richmond.